A Summer Of Breyer Horse Events! It is May 31st and summer is right around the corner. For many, school is out and free time is at a peak, and for many others Vacations are a welcome respite to the daily grind. Whatever kind of break you can find for yourself this summer, why not fill it with a bit of your hobby and go to a Breyer event? The first event of the summer is BreyerWest, a smaller version of Breyerfest held in Sacramento, California. Taking place June 11th-13th, this event is stuffed full of seminars, two model horse shows, its own special run and a raffle! For those of you on the west coast this is a wonderful opportunity to attend a large Breyer Event! Up next on the calendar is Summer Break Live, Golden Oak Stables’ all novice show. For those of you in the New England area, this will be the novice event of the year! New showers are always welcome as are previous showers and it is starting to fill up quickly! As with all of Golden Oak Stables’ shows, there are dozens of classes and tons of divisions all waiting to award your horse with that coveted blue ribbon! There is also a fun day being held in conjunction with the lives show, so even if you aren’t going to show, stop on in to the party! Quickly approaching is the model horse event of the year, Breyerfest held in Lexington, KY. This year is a special one for collectors though. This year, marks both the North America Nationals Model Horse Show being held the same weekend, but also the World Equestrian Games which are right around the corner in September. The North American Nationals is a show that brings people from all over the country and the world to compete with their model horses to award national championships. Similarly, the WEGs bring competitors from all over the world to Lexington, Kentucky, this is the first time its been held outside of Europe, for competition over 8 different disciplines. Lexington, and the whole state of Kentucky have been working hard to get things ready for the event, and model horse collectors will get to be some of the first to see these changes in July! Last but certainly not least on the calendar is Golden Oak Stables’ Workshop Day in August. This event will show you different hobby disciplines and how to create projects of your very own! Details are still in the works, but stay tuned to Stable News for all the latest news on this and all kinds of other hobby events! As collectors, we all have models which we’d like to add to our collection at any point in time. Some are simply models which you haven’t had the chance to add to your collection just yet, but others are ones which you have searched high and low for, often called “Holy Grails” by hobbyists. With collecting of any sort, you’ll encounter times when you want something you simply don’t have. There are thousands of Breyer horses and hundreds of different molds, each of them completely different. Some collectors choose to collect all of one mold, which can narrow down a search a bit, but still make it very difficult to fill those holes in a collection. Others simply buy what they love and have “grails” which they are seeking out. Some collectors have a hard time finding grails, and some are very simple to find. Breyer horses are produced in a myriad of numbers, from one of a kind models which can be extremely desirable, to a regular run model that has tens of thousands produced. So the search can vary quite a bit. For me, many of my grails are horses which have sentimental value that have left my collection that I’d love to add back. Horses from my childhood which I didn’t care for properly top that list. Many other collectors also love to relive their childhood Breyer experiences as adults and can have those memories again through their horses. One of the easiest way to find these horses again is through Golden Oak Stables’ Vintage Collection which is full of dozens of mint condition discontinued models! Take a look to see if your “Holy Grail” or childhood model is there, and be sure to check back as stock changes! No matter what you collect, or what you are looking for, simply collecting is the most important thing. The love of model horses is the thread that binds us all together. Whatever your “Holy Grail” may be just keep looking. Whether it is a one of a kind or an easy to find current run model, just keep looking and collecting. There is no better feeling than getting that model you’ve been searching high and low for, and once you’ve found that model, there’s always another model out there to hunt for! BreyerWest! A Pacific Breyer Horse Affair! For those on the West Coast, it may seem like a far trek to Breyerfest in Lexington, Kentucky, but you’re in luck! June 11th-13th Breyer makes its way over to the West Coast for one wonderful weekend of fun! For the past couple years, West Coast hobbyists have been able to welcome Breyer West to the Western States Expo Center. This event, smaller in scale but very similar to the beloved Breyerfest, is a welcome reprieve from the long trip from the Pacific Ocean to Kentucky. Now just a quick jaunt for many hobbyists to Sacramento, California, many hobbyists can enjoy a weekend of model horses hosted by the biggest and greatest model horse company, Breyer! The weekend is full of model horse demonstrations from the hobby’s top talents. These artists, prop makers, tack makers, and more come from all over the country to show off all of their talents. From customizing to tack making, just about any project you can think of will be showcased at some point during the weekend! There are also two model horse shows to be held during the event. The Open Show will bring some of the countries most difficult competition together to win the coveted blue ribbon. The Novice Show is the perfect event for those still learning about the hobby. Lastly, but certainly not least, is Escondido. Limited to Breyerwest, Escondido is a beautiful Palomino Peruvian Paso that only attendees may purchase. This stunning palomino is featured on the El Pastor mold and is a dream in an amazing shade of buttery, golden palomino. Word has it that attendees may even have a chance to win a foal for Escondido! Breyerfest and Breyerwest are two amazing events, and even if you can’t make it to either, Golden Oak Stables and Stable News will keep you up to date with all of the happenings! Mark that calendar, Breyerwest is only a few weeks away and Breyerfest is just around the corner! Floating through the sky in colors of blue, orange, pink and purple, Wind Dancers are colorful little fillies and mares ready to tickle the imagination. A relatively new series, Wind Dancers capture the imagination of many with their whimsical appearance, and their bright colorful colors made them a quick favorite. This series offered in its entirety by Golden Oak Stables is enough to capture the interest of any horse lover! The Wind Dancers are sculpted by Kathleen Moody, who is known for sculpting many of the most fanciful and favorite Breyers. Her sculptures capture the imagination by flirting on the edge of realism and fantasy. The Wind Dancers mares all feature long manes and tails as well as large gossamer wings which glisten in the sun and the fillies, while smaller in size, still have the iconic gossamer wings making them a perfect match. These models are sized larger than Stablemates, nearly Paddock Pal Sized, sitting at about 4-5 inches tall for the adults and 2-3 inches tall for the foals, are perfectly sized for collecting or playing! Kona is a navy blue horse with two front stockings and lighter blue wings. She is pranced up a bit and ready to take off! Sirocco is a bright orange beauty that is reared up on her back legs. She has large wings that flitter in the sun with colors of light orange, yellow and pink. Bright and pink, Brisa dances in the sun in the brightest of pinks. Her light pink mane and tail accent her wings which are accented in dark and light pinks along with a touch of blue! A beauty in grey, Sumatra is beautiful in an understated grey with a white mane and tail. She trots her way along with teal wings that accent her understated color beautifully. Every mare needs a foal and The Wind Dancers Gift Set is a set of four foals, each of which match the adult Wind Dancers perfectly. These tiny foals are as colorful as their mothers and also have large translucent wings which glitter and glisten in the sun! Breyer has also created a series of stories to complete out the Wind Dancers line. These stories tell the stories of each of the Wind Dancers and capture the imagination of the horse lover in all of us! Young or old, Wind Dancers capture the love of horses we all have and remind us of a land of fantasy which is often easily forgotten. This weekend marked the second jewel in the Triple Crown for horse racing. Sadly we must wait another year for a chance to see the drought broken, but this is a race that has brought us amazing horses and will continue to bring us amazing horses that will make racing history for years to come. Last year’s winner, Rachel Alexandra, is no exception. This amazing filly broke out of a field of colts to cross the finish line first and touch the hearts of the world. Foaled on January 29th, 2006, Rachel Alexandra is the big filly that can do just about anything. Named after her owner Dolphus Morrison’s granddaughter, Rachel Alexandra comes from two lines of amazing race horse royalty, Mr. Prospector and Native Dancer. She shot to super star staus after winning the Kentucky Oaks with Calvin Borel on board. The pair then went on to win an unprecedented nine races as a three year old. Calvin Borel, one of the countries most prolific jockey’s has had amazing success with her and has nothing but amazing words for this super girl. Calvin attributes her outstanding record to letting her do her own thing on the track and not holding her back. Golden Oak Stables adds another winner to the stables with Breyer’s beautiful version of Rachel Alexandra. A spring release for 2010, the Rachel Alexandra model is a strikingly done galloping Thoroughbred done in the perfect image of the real Rachel. Breyer’s Rachel is done on the traditional Ruffian mold in a deep shaded bay. Highlighted by accurate shading this seemingly simple bay paint job is the perfect touch of simplicity and accuracy. One of the most intriguing things about the real Rachel Alexandra is her facial marking that has been described as an upside down exclamation point. Breyer is right on point with creating her with the utmost of accuracy with the hyper realistic facial and leg markings. This super filly is nothing to scoff at. It has been many years since we have seen such a strong filly be able to hold her own against the colts in her field. Truly deserving of the honor of becoming a Breyer horse, Rachel Alexandra is the kind of horse that only comes around so often. Don’t let her gallop away. How To Make Your Way Into The Winner’s Circle With Your Breyer Horse! Showing Breyer horses can be just as difficult and rewarding as showing real horses. The competition is just as competitive if not more than many real life horses shows. 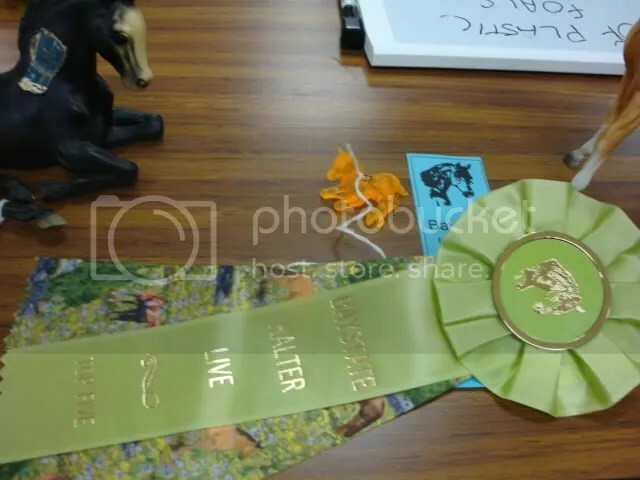 At Golden Oak Stables Shows classes are often filled to the brim with entries and there are only 10 ribbons to go around, so winning a 10th place ribbon can be just as prestigious as winning the blue ribbon! Even though the competition really depends on what else is on the table for that class, there are a few things that you can do to improve your chances and create a truly amazing entry! The easiest thing you can do for any entry is to do your research. This is very important for an entrant and really impresses the judges. Finding a breed that truly looks like the model you are showing is a great way to catch the judges eye and finding a photo that looks just like your model can make it stand out in a crowd. But don’t get caught up if you can’t find a photo, there are plenty of instances that simply picking a wonderful breed has made a horse stand out. A breed winner that made an excellent warmblood. Research is also important for performance classes; details can really make or break your entry. Taking time to learn about all of the equipment and proper setups for their real life counterparts is one of the most important things to do for your performance entries. Many showers have experience with real horses and do have a bit of an advantage. For those of you that may not have had the same experience, watching competitions as well as reading can help bridge the gap. In addition, finding a really versatile model that can show in many classes can help bring home a championship ribbon. In collectibility much of the determination is on how rare or collectible the model is, but having an entry with ephemera, correct information and a model in great condition can make the determination between 1st and 10th place. 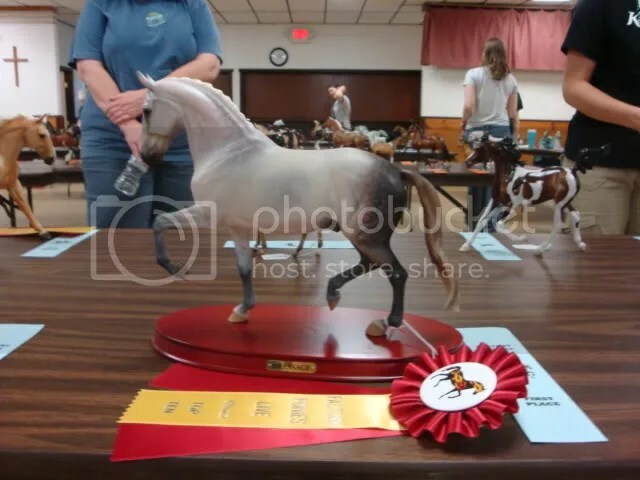 In many cases, hard to find, mint, vintage models with information on the release can win a class over a much rarer model because the condition is better and there is information letting the judge know that you are aware of what the horse is and what makes it rare. In newer hard to find models, it is very important to document where you have gotten the horse, because far too often the authenticity is on your shoulders for keeping the history of that model alive. A collectibility entry with documentation from the time he left the Breyer factory! Calling All Model Horse Show Stars! 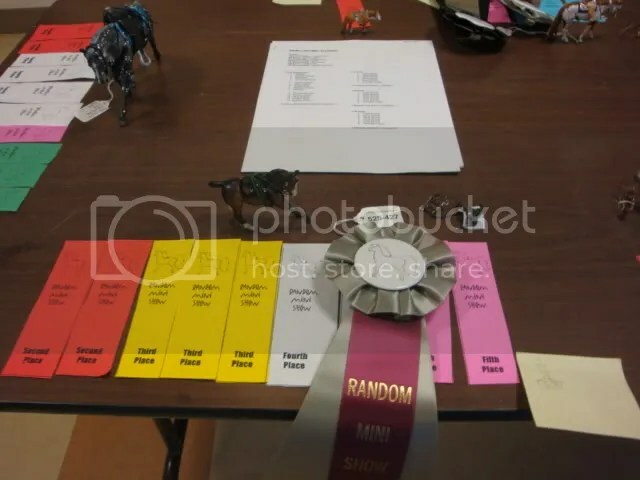 If you are doing well at the model horse shows, we just may want to feature you in Winners’ Circle in Just About Horses! We are looking for junior and adult competitors to feature. Send us information about yourself (name, address, age, phone number) the show where you did well (including your classes), and a picture of your winning entry. You can look at Winners’ Circle in your Just About Horses magazine, and follow the format to provide information. The image must be a jpeg attachment, 300dpi, 4” by 6”. Send us the information right away with a phone number to editor@reevesintl.com and you may soon be in the Winners’ Circle! Summer is just around the corner as is Golden Oak Stables’ Summer Break Live as well as Breyerfest as well as dozens of other live shows. If you’ve never been to one here’s some tips to help ease the worries and butterflies for your first show. 1. Send in your entry as soon as possible. This is the most important thing. Show holders need to know as soon as possible how many people to plan for and many shows also sell out quickly, so sending your entry early can easily make the difference between attending and not attending. 2. Bring only your best and favorites. Choose your horses judiciously and don’t bring any that have large rubs or chips, unless there is a fun class for that. Also bring enough to keep you busy throughout the day but also enough time to enjoy the show. A good rule is one to two horses for every two classes approximately. 3. Don’t be afraid to ask questions, for questions about the show prior to the day of the show, ask the show holder any questions you might have. The day of the show you can ask the judge about any placings you might have as well, just be sure to ask after the class and not a few hours later. Its difficult to remember each placing after you’ve been judging all day. Don’t be afraid to chat with other showers too! Model horse hobbyists are normally more than happy to help one another. 4. Follow the rules to a T. That means things like, plan to get there when the showholder suggests and not earlier or later, and follow instructions for how to do horse tags or note cards (Whatever is used in your region). These may seem like little things but it truly makes the entire day run smoother if you take the time to read the rules fully and if there is something you have a question about feel free to ask! The rules were made to keep the day running smoothly. 5. Bring a tablecloth, and pack your horses well! There’s nothing worse than damaging a horse when taking it out to a show, so packing your horses well can help with that. Don’t overpack your boxes or totes, and be sure to wrap your horses in either bubblewrap or old clean t-shirts. Also bring a tablecloth to lay down on your table because horses often do tip over and falling on a table cloth rather than a table can be the difference between breaking and not getting a rub. Live shows are great chances to meet people of similar interests as well as bringing home ribbons for the horses in your stable. Take time to chat to your neighbors and just have fun! You are currently browsing the Stable News blog archives for May, 2010.